When it comes to coding, practice makes perfect. The more you code, the better you will be at it. Being better at coding doesn’t mean your learning process is over, it just means you are ready to take on bigger challenges. For this exact reason we created the skill challenges. These challenges are designed to get you ready for more advanced topics, whether on the CodeMonkey platform or in real life. Skill challenges will unlock as you progress in the game, and each of them holds another opportunity for you to practice the topics learned. 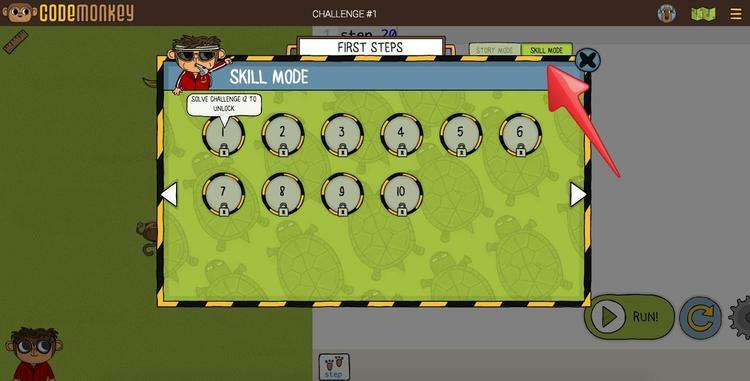 You can find the skill challenges in the map, under the “skill mode” tab in the upper right corner.